Texans defensive end J.J. Watt showed up with a cast on his hand today, and didn’t practice. Watt said he broke his hand, but that the injury won’t keep him out of Sunday’s game against the Patriots. How’d that happen? There aren’t many other details about the injury, so consider the following: Watt tweeted a photo of game film side by side with the Victoria’s Secret Fashion Show on Tuesday. Watt does everything with intensity. I watched enough footage of him practicing drills off the snap on Hard Knocks to know this. Did J.J. Watt get hurt while simultaneously going to town on himself and studying tape? We emailed the Texans for comment and will update if they respond. 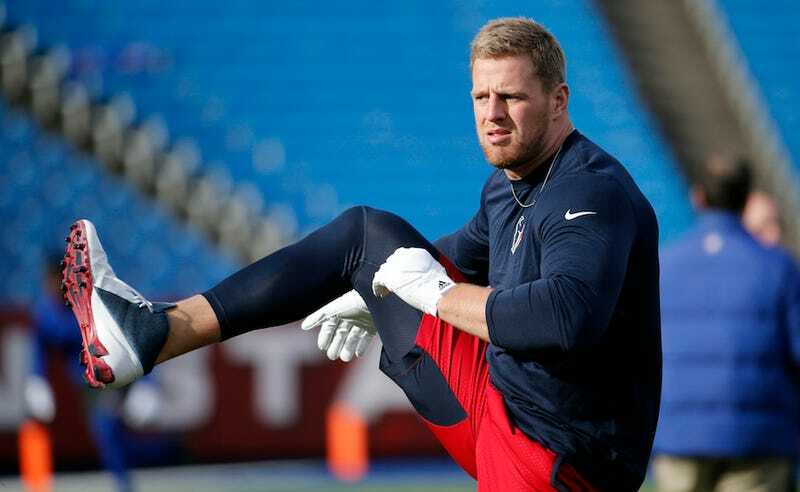 Update (3:24 p.m.): A spokesperson for the Texans replied, and said Watt broke his hand during a drill. He was firm that the injury had nothing to do with the Victoria’s Secret Fashion Show. Contact the author at samer@deadspin.com.